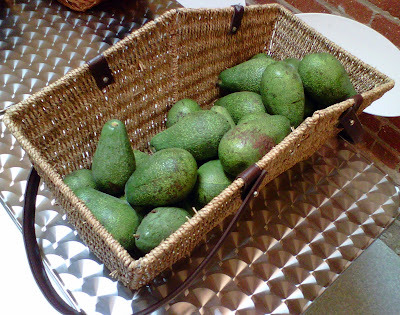 My coworker brought this large basket of avocados to work today. A tree in his backyard is, well, prolific, and office mates have been the lucky recipients for several weeks now. I'm taking a few home with me, and I'm hoping to try baking something sweet with them. Cupcakes, yeast bread, pancakes, ice cream, not sure! If you have any tips or suggestions or recipes for great avocado baking, please let me know! I did make Sweet Pea Cupcakes with 2 cups of mashed canned peas once, and let's not forget the ever-popular Pork-n-Beans Cake Minus the Pork; so I'm no stranger to bizarre ingredients in baking. But I'm new to the avocado baking scene. Inspire me! I have a friend who makes a really good avocado pie. It's sort of like a sweet potato pie except with avocado. Whatever you make, invite me over please! I haven't baked with them, but I did roast them. Just cut them in half, drizzle some olive oil and pepper on, roast until done...the skin peels off and then I topped them with caramelized onions sooooo good. I've never had avodado pudding, so how about this? Sounds very easy! Puree avocado, lime juice, and sugar in food processor. Stir this into the yogurt. Sweeten with more sugar to taste. Spoon into custard cups and garnish with lime. This is from a great book, called "Vegetables on the Side" by Sallie Y. Williams.